Great news overnight, with one of Explore Communications’ clients winning an Australian CRN Impact Award. While winning is no certainty, industry awards and formal recognition are a fantastic boost to the business in so many different ways. There is of course the exposure and networking opportunities of the awards event itself, the broader publicity that comes from it, the third-party validation that you are doing something that is at the top of your industry, and the great feeling of having an accolade that is yours to promote until next year’s awards come around. And, if there is an individual or team recognised from your business with the award, it has a fantastic positive effect on staff morale and culture. What a lot of people don’t realise is that winning an award like this doesn’t just happen. If the award program requires a detailed submission to go to a judging panel (which most do), having the best piece of technology, the best project or the best business performance isn’t going to be enough on its own. Judges might be wading through hundreds of submissions, so the ones that stand out are those which demonstrate that a lot of thought, effort and time has gone into completing it. To stand up and sing for the judges, the story behind the submission needs to be compelling, it needs to be well-written and well-researched, it needs to represent the voices of the various parties and stakeholders involved, and it has to convey how the company has smashed it out of the park in relation to the subject of the award itself. It’s true that you have to be in it to win it, but if the awards program is run with any form of rigour and impartiality (which most are) , there’s no point just dashing off your submission the night before deadline. Instead, take your time. Normally, awards are announced a couple of months out from submission deadlines, so work out which categories you can enter, and if you think you have a good chance if winning, then give yourself at least a month to get the submission right. And even if you don’t win, the work you have put into the submission won’t have gone to waste. It can be used in a whole lot of other ways afterwards: for case studies, press releases, marketing materials, client communications, newsletters, new website or intranet content, blog posts, annual reports or to update your corporate profile. Businesses are constantly looking for that next growth opportunity or new revenue stream, and coming up with marketing strategies to deliver on that goal. That’s an easy thing to achieve if you are a start-up, but not so simple if you are an established brand with a deeply entrenched product or service. Take Vegemite as an example. “A thick, black Australian food spread made from leftover brewers’ yeast extract” (from Wikipedia), Vegemite has been an institution here for the best part of a century (and a mystery as to why we like it so much for people from other countries). In 2009, a new version of Vegemite was released, mixed with cream cheese. It made news for being a massive branding failure (“iSnack 2.0“) but it was pretty clear to see it was an attempt to make people use more of the product. You see, most people spread Vegemite very thinly. In my house, the amount I put on my toast is considered excessive (see above), which should give you an idea. With its intensity diluted by the cream cheese, what was ultimately called Vegemite Cheesybite seemed to be all about increasing the spread amount and therefore consumption volume. If your target market doesn’t perceive that you are adding value, they will see your strategy for what it ultimately is – an attempt to influence overall consumption levels for revenue and profit growth. Which brings us to Blend 17. Hot on the heels of the return of Vegemite to Australian hands (by Bega Cheese last year), this new boutique variety was launched, retailing for more than double the price of the ordinary Vegemite. So, instead of a strategy that increases consumption volumes, this one is about convincing people to pay more for the same quantity. Does that strategy work? Only if the consumer perceives they are getting added value. With Blend 17 finally on sale for the same per weight price as normal Vegemite, I bought a jar. Maybe a slightly smoother, more intense flavour, but only marginally better than the original and certainly not worth paying double for it. Which probably explains why it was 50% off when I bought it. So what’s the answer? How can you generate more revenue and profit from one of your flagship brands? Keep innovating, but whatever you do don’t jeopardise the brand equity and consumer loyalty built up in your core product (think BBQ Shapes). Come up with new packaging and bundling ideas using the original product. Look for new markets – Vegemite managed to win over Australians, so why not the Dutch? They like salted liquorice, after all. Another recent ‘bumpy’ travel experience gave me an opportunity to reflect further on brand experience. This one relates more to the way brands should respond to negative feedback. The irony is that if I had received an adequate response to my complaints, I wouldn’t be airing the experience in public now. To give context, I need to refer to the companies involved and, unfortunately, Qantas is once again in the mix. Earlier this year, we made a snap decision to visit a friend in Gladstone, Queensland and used the opportunity to book two nights on Heron Island while we were in the area. The whole travel experience – from the booking process to the Heron Island stay – was poor, and I followed up both with the booking provider (Qantas Hotels) and the resort operator (Delaware North) taking them through the whole debacle. It only magnifies the issue when you have to follow up on your email when you don’t get the promised response. “I am very concerned that your experience was so disappointing and am currently reviewing your complaint with my management team. If you are providing a service under your brand, take complete ownership for that service. As a customer, there is nothing worse than a brand passing the blame onto another provider. This happened twice during this experience. If you are advertising ‘contact us’ information, make sure that you are actively managing it, setting response times and following up on each channel you are using. To this date, I still haven’t received any response to my original email to Delaware North. The escalation only came when I tweeted about it. I’m assuming that the general email (travel@delawarenorth.com) is not being properly monitored. And I just did both. Most of the domestic Australian flights I’ve caught in the past have been short ones, so until now I hadn’t really taken much notice of the inconsistency of the on-board experience. A couple of longer-haul trips to Darwin in the last month – three legs with Qantas and one with Jetstar – made me sit up and take notice. On one flight, I couldn’t help but do that – my seat wouldn’t recline. The key thing as a customer is that you want to know what to expect. On Jetstar, you know you’ll get the bare minimum. However, on Qantas you pay a little extra with the expectation of a premium service. While most service businesses make a big thing about consistent customer experience, lately there’s been very little of that on Qantas planes. I’ve had a different user experience each time I’ve flown. On the Sydney to Melbourne route there is barely time for food service, but four and a half hours to Darwin can really drag on – especially in a no frills Jetstar cabin. You crave the food service and in-flight entertainment on offer to provide the distraction needed to make the trip go faster. On each Qantas flight, I’ve had three different entertainment configurations – an individual screen on the back of the seat, a seat pocket iPad on the second flight, and then BYOED (bring-your-own-entertainment-device) and download the Qantas Entertainment app. Then you have food and beverage service. I had complementary drinks for one of the legs, but on the other two they were selling beverages for $6 each. Is it really worth Qantas’ while to charge $6 a drink? Surely serving the first drink for free with your meal is going to generate far more goodwill and less bother than completing a hundred separate cash transactions as the flight attendants make their way down the aisle. I like to be all set with what I’ll need in my seat before I get on the plane – book, headphones, etc. – so I can put my bag up in the overhead locker and hopefully not have to touch it again until we land. Knowing what to expect from the on-board experience before the flight would be very useful. Ultimately this inconsistency is a corporate brand issue. If the customer experience doesn’t consistently meet up to the expectations set by the organisation’s brand “promise” or values, it has a damaging effect. Where will you get your news? There were reports this week of not one but two more journalists leaving the Australian technology media scene and moving into marketing communications roles – Nick Ross to Filtered Media and Chris Player joining Seccom Global. While it’s long been a conventional career path for some journalists to move into corporate content and communications jobs, the rate at which it is happening now seems to be escalating, and it doesn’t look like all of these journalists’ posts are being replaced by new blood. It’s no wonder graduates like Paul Maland are pessimistic about their future in the industry. All of this is not really news to most of us – people have been talking about the uncertain future of traditional media for years – and discussed at length again just this week in the AFR with Buzzfeed’s Jonah Peretti. Peretti makes a point in the AFR article that trust in the media has been eroded – because people are thinking that “legacy media companies” are “hiding stuff” from us. But what are the alternatives? Where else do we go for the objective or independent “truth” on what’s happening in the world? Back at Australian Federal Budget time (early May this year) I was thinking about this. Of course, the major print and online publications all had extensive reports on the Budget, but I thought this was a good time to get a sense of how much “journalism” is now taking place in the corporate world, so I scanned all the big financial services company websites. Many of them had teams of writers producing their own budget reports and analysis – I’ve extracted some screenshots below as examples from AMP, ANZ, CBA and NAB. On the face of it these corporate versions of “Federal Budget 2017” coverage look like they are doing the same job as the newspapers. But what is actually happening? Are people now relying on their bank or their superannuation fund for financial news they can trust? And is that the same across other industry sectors too? After a long hiatus from posting to Explore Comms, we are finally back! It was an article published just over 30 years ago in the Sydney Morning Herald that inspired me to write again. I came across the piece when I was doing some background research on Craig Elias – my business partner in a sporting venture that we are currently working on together. 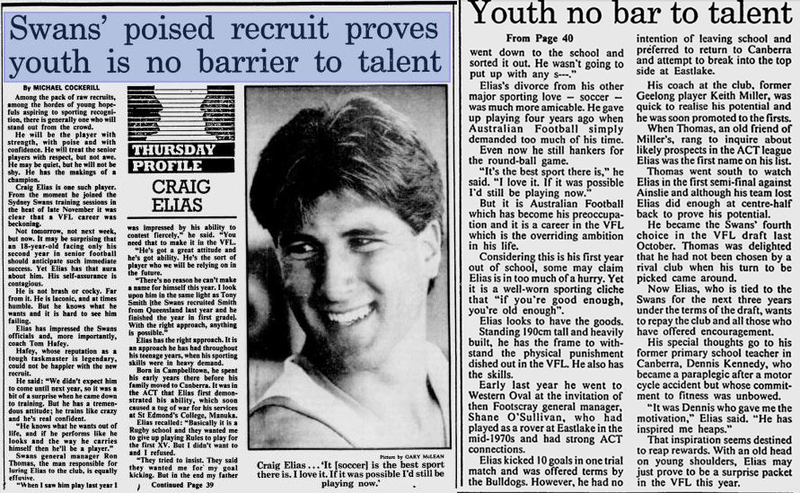 Back in 1987, Craig was a promising new recruit who had just been signed on to a three-year deal with the Sydney Swans, one of our country’s leading Australian rules football (AFL) clubs. Unfortunately for Craig, serious injury cut short a promising career, but he’s managed to forge a successful business and family life post-footy. In his younger days, Craig would have been the perfect candidate for a reality TV show concept that I think would be a huge hit if done the right way. In it, promising young sportspeople who have had their careers affected by injury, life circumstances or poor choices, are given a second chance to succeed in their chosen field. It would make great television to see these young people overcoming their challenges to rise back up to the top. That idea only ever stayed at concept stage – but now we are developing something that will bring things full circle from a sporting perspective for Craig. We are approaching an exciting moment in the development of our venture, so watch this space for more news in the coming months!